Despite starting out as a rather run-of-the-mill Wednesday, the 18th of May, 2016 turned out to be a particularly good day for horned dinosaurs as not one, but two new species of ceratopsids were announced! Even better, there was one from each of the two major ceratopsid clades, the Chasmosaurinae and the Centrosaurinae. Both species were described from a single specimen and they both showcase exciting new headgear that provides clues to the evolutionary origins and patterns within their respective clades. Machairoceratops cronusi: This spikey new dinosaur was described by Eric Lund et al. (2016) from the partial remains of a skull that was collected from the Upper Member of the Wahweap Formation in southern Utah. The exact geologic age of the specimen is poorly resolved, but it falls somewhere near the younger end of the 80.1–77 Ma age range attributed to the Wahweap, and firmly in the Middle Campanian. Suffice to say, it’s old – for a ceratopsid. Probably more importantly, it is considered to be stratigraphically higher in section than the closely-related Diabloceratops, the oldest known ceratopsid, and a dinosaur which Machairoceratops closely resembles. The most striking feature of Machairoceratops is its epiparietals (the bony spikes that grow along the outer edge of the dinosaur’s frill). The P1’s, the innermost epiparietals on both sides of the midline, are the only ones that were preserved but they more than make up for the absence of their neighbours (and if Diabloceratops is any guide the other ones were probably uninspired anyway…). Measuring 44 cm long, these sickle-like projections curve forward from the posterior margin of the frill, sticking over the head of the dinosaur like giant fork tines. Or curved swords, depending on who you ask. These twinned spikes are the source of the dinosaur’s name, as well as its identity: Machairis means ‘bent sword’ in Greek, and the species epithet, cronusi, refers to the Greek god Cronus, who, aside from eating his own children, used a sickle to castrate his father, Uranus. I believe the sickle is the important detail here. Holotype cranial material (A) and reconstruction (B) of Machairoceratops cronusi. Credit: Figure 3 from Lund et al., 2016. Diabloceratops also sports elongate P1’s, but those project to the side instead of forward. The difference in orientation could potentially be explained by individual variation but a few other salient details of the P1’s, in combination with features of the epijugal and squamosal, and the stratigraphic separation of the specimens, were considered sufficient to distinguish the taxa. But the two species also share some important features. Both possess elongate postorbital horns, with Machairoceratops’ horns measuring in at 27 cm long – puny next to a Triceratops but enormous when compared to the stubby brow horns of more derived centrosaurines like Centrosaurus and Pachyrhinosaurus. Possessing long brow horns is a trait shared with other early centrosaurines such as Nasutoceratops, Albertaceratops, and Xenoceratops, and seems to represent the basal condition for centrosaurines. The frill of Machairoceratops has the appearance of being somewhat pinched at the top, an oddly endearing feature it shares with Diabloceratops (see below). This gives their frills an overall triangular shape and distinguishes them from the rounded frills seen in all other centrosaurines (see below). Together, these two southern taxa may exhibit some of the plesiomorphic traits of the clade (large postorbital horns and a relatively unadorned triangular frill) and may also represent a southern population of centrosaurines distinct from those that radiated further north. Comparative reconstructions of centrosaurine ceratopsid parietals. A, Wendiceratops pinhornensis; B, Xenoceratops foremostensis; C, Centrosaurus apertus; D, Styracosaurus albertensis; E, Achelousaurus horneri; F, Albertaceratops nesmoi; G, Pachyrhinosaurus lakustai; H, Einiosaurus procurvicornus; I, Diabloceratops eatoni. Credit: Figure 15 from Evans and Ryan, 2015. Spiclypeus shipporum. Credit: Michael Skrepnick. Spiclypeus shipporum: Collected from the lower Coal Ridge Member of the Judith River Formation of Montana, this tongue-twisting dinosaur (pronounced ‘spick-LIP-ee-us’) dates to ~76 Ma and is nicknamed ‘Judith’. Described by Jordan Mallon et al. (2016), the specimen includes a partial skull and a small amount of postcranial material, but luckily many of the important diagnostic elements were preserved. The postorbital horncores project up and out to the side, over the eyes, and measure 23-24 cm in length – notably, these are shorter than the brow horns of Machairoceratops, a centrosaurine. Not to be outdone, Spiclypeus has some striking epiparietals of its own to show off. Fused together right across the width of the parietal, the P1’s, and P2’s curl forward whereas the P3’s twist up and point backward. Together they combine to create an aesthetically pleasing semicircle at the back of the frill that measures nearly a foot wide and exaggerates the shape and size of the posterior medial embayment. The arrangement of the epiparietals in Spiclypeus is considered to represent a transitional step toward the condition seen in Vagaceratops and Kosmoceratops, with the anterior curl of the epiossifications appearing first near the midline and then progressing laterally. Skull reconstruction of Spiclypeus shipporum, with missing parts of the skull faded. Credit: Figure 3 from Mallon et al., 2016. One of the uniquely interesting aspects of this specimen is that the left humerus is severely pathologic (see below). The distal condyles are eroded and broadly displaced meaning the articulation with the forearm likely would not have functioned properly. In particular, the distal half of the bone shows extensive erosional pitting and channels, the development of a large abscess cavity, and shards of dead bone captured within the marrow cavity. Thoroughly unpleasant, the symptoms suggest that the dinosaur suffered from osteomyelitis, an infection of the bone. This may have been caused by a fungal infection or tuberculosis. The infection would have been debilitating and painful. Michael Skrepnick’s gorgeous artwork (shown above) shows the animal favouring its left forelimb. 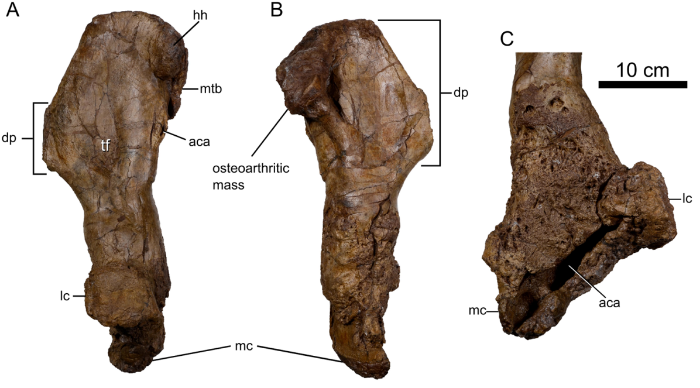 Despite the pain, remodelling in the bone of the humerus suggests the dinosaur persevered and continued to walk on the forearm for a prolonged period of time*. In addition, the frill appears to have been stricken with the same infection with multiple pathologic fenestrae identified on both squamosals. Before the infection set in, the initial injuries to the frill could have been obtained during combat with a rival, although that cannot be determined with certainty. Pathologic left humerus of the Spiclypeus specimen. Notice the displacement of the condyles in C) and the aberrant structure and surface texture. Credit: Modified from Figure 12 from Mallon et al., 2016. By all accounts, this dinosaur lived a rough life. And even after it died it was scavenged by tyrannosaurs, as evinced by tooth marks on bones and two tyrannosaur teeth found in the quarry, and thoroughly trampled before being rapidly buried. After all of that, to be described as a holotype specimen and to contribute to our understanding of chasmosaurine evolution is hopefully some small vindication for this admirable dinosaur. Both of these new ceratopsid species are charismatic, novel, and informative. Both provide glimmers of insight into evolutionary patterns within their respective clades: Machairoceratops at the very beginning of it all, revealing the humble origins of the diversity to come; Spiclypeus buried deep within a subclade of the Chasmosaurinae, informing on just how Kosmoceratops may have gotten that frill after all. As with every new ceratopsid species, the most defining characteristics of both species are in their horns, frills, and frill adornments. This is a pattern we see repeated time and again as every new taxon seemingly presents an expansion in the disparity of epiossifications, exhibits a novel suite of horn morphologies, or redesigns the frill. Indeed, when viewed at the broadest scale the ever-expanding variation in ceratopsid cranial traits can be fascinating and mind-boggling at the same time (look no further than Julius Csotonyi’s “Ceratopsian Cornucopia” for a beautifully illustrated depiction of this variation). At times it seems to verge on being predictably unpredictable; that each new species simply muddies the waters of our understanding, especially when those new species are things like Regaliceratops. But with every fresh disruption of our assumptions comes new insights. Both Machairoceratops and Spiclypeus have shown that new and strange forms can fill in gaps in our understanding, not just create them. These small advancements are adding up to provide an inner structure to the broad-scale evolutionary hypotheses. And this is a very good thing because there are at least a handful of new ceratopsids already on their way, all at varying stages of being prepared, described, and published. As these species continue to arrive and to shake things up for the better, we’ll need to be running just to keep up! Evans DC, Ryan MJ (2015) Cranial Anatomy of Wendiceratops pinhornensis gen. et sp. Mallon JC, Ott CJ, Larson PL, Iuliano EM, Evans DC (2016) Spiclypeus shipporum gen. et sp. Ben received his M.Sc. from the University of Calgary in 2012. For his thesis he studied the morphological variation in the horns of the ceratopsid dinosaurs Centrosaurus and Triceratops in the hopes of finding evidence of sexual dimorphism, using modern horned mammals as a guide. He remains in awe of the fantastic and ever-growing diversity of ceratopsids and is interested in understanding the evolutionary processes and selection regimes that shaped their myriad forms.